Sunday’s Chubu Trim Marathon is a family affair. 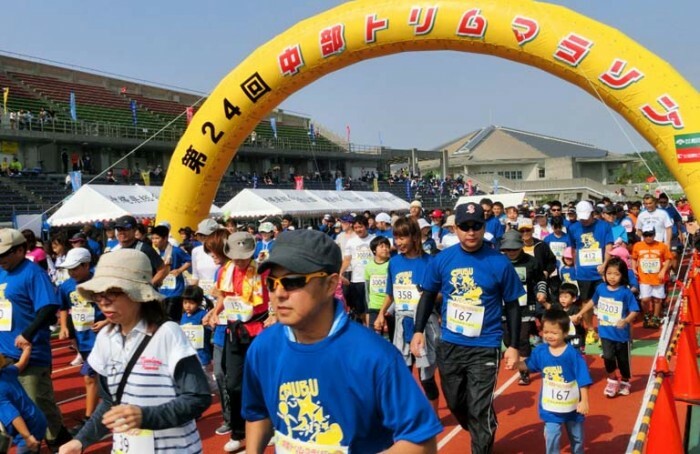 The routes are marked for the four races in Sunday’s 25th Chubu Trim Marathon, which starts from Okinawa Comprehensive Athletic Park, and organizers say nothing’s going to stop the action. The race slots were filled prior to the October 13th registration deadline, and the race committee has everything set, working around renovation construction of the athletic stadium. This year’s Chubu Trim Marathon start and finish lines will be at the sub athletic field from athletics stadium. All four courses will be changed. A detail map of every course can be checked on website, http://chubutrim.ti-da.net/e6670282.html. Opening ceremonies are at 8:30 a.m. Sunday, with the 20km race starting gun at 8:50 a.m. Runners have two hours and 50 minutes to complete the course. There’s a one hour and 30 minutes time limit for the 10km race, which begins at 9:20 a.m. A 5km race starts at 11:50 a.m. with an hour to complete the run, while there’s a 1 p.m. 3km race, also with a one-hour timeline.